Cuba lifts travel restrictions for citizens exiting country; trickle down effect into tourism? The effects of the significant rule change depends on which nations will offer average Cuban visas, as intellectuals like doctors and lawyers will not be allowed to leave to avoid a national “brain drain.” And remains to be seen if it comes back around in bigger inbound travel into Cuba. The Cuban government’s decision to lift its deeply hated requirement of exit permits for citizens to travel abroad, while retaining other tough controls, will give perhaps millions of average Cubans a better shot at living abroad. It may also generate an increase in the cash remittances going to the island, from the increased number of Cubans abroad, and ease some of the pressures growing under ruler Raul Castro’s decision to lay off 1 million state employees and cut subsidies on food and the health and education sectors. 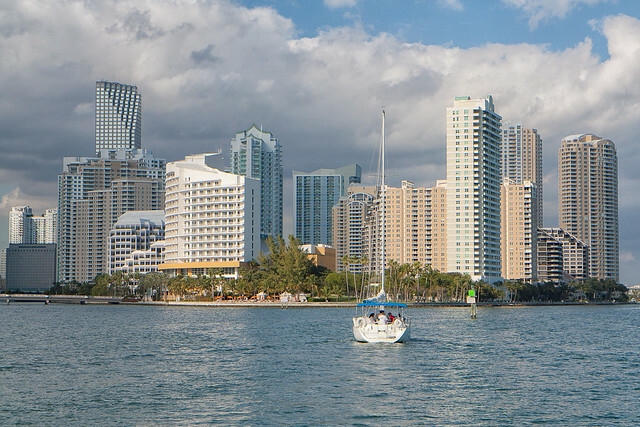 Miami, one of the likeliest destinations for Cuban visitors. Photo by John Spade. But the decree published Tuesday also indicated that Cubans who have had problems obtaining exit and entry permits in the past are likely continue to do so: physicians, military and government, dissidents at home and outspoken critics abroad. “The devil is in the details of the new migration law,” wrote Havana blogger Yoani Sanchez in a Twitter message. She also called it “gatopardista,” a reference to a situation where change is more apparent than real. News of the decree set off smiles across the island among Cubans who have been complaining for decades about the exit permit, known as “the white card,” required even if the travelers had valid visas to enter other countries. Abolishes the need for the exit permit, which cost $150. Abolishes the $200 “letter of invitation” that foreigners had to send Cubans so they could apply for passports and visas. Abolishes the entry permit for Cubans living abroad, and extend their allowed stay in Cuba per trip from one month to three months, which can be extended. But the decree and an editorial in the official newspaper Granma on Tuesday made it clear Cuba will maintain strict controls on citizens traveling abroad and exiles returning to the island as long as U.S. immigration policies favor Cubans so much. “So long as there exist policies that favor the ‘theft of brain’ designed to take away from us the human resources that are indispensable to the economic, social and scientific development of the country, Cuba will be obliged to maintain measures to defend itself,” Granma said. Supervisors must still approve the issuance of passports to top government officials, university professionals, physicians and other medical personnel, top sports figures and others who carry out “vital” functions.